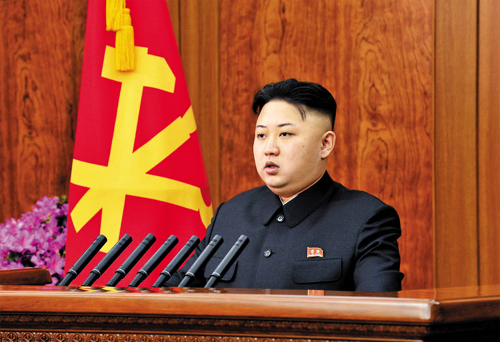 North Korean leader Kim Jong-un's New Year's address struck an unaccustomed friendly note. Under his father Kim Jong-il, the customary New Year's editorials in the state press rarely missed a chance to slander South Korea and its main ally the U.S. when there had been an election in the South. The 2008 editorial, just before the start of the Lee Myung-bak administration, thundered that South Korea must "throw away its confrontational mindset" which names North Korea as its "main enemy." In January 1998, just before former president Kim Dae-jung took office, the editorial said nothing would change in the South simply because of a change in leadership. And the 2003 editorial, just before the start of the Roh Moo-hyun administration, called for the immediate withdrawal of U.S. troops from South Korea. Kim Jong-un's speech was by far the most conciliatory yet. The Korea Institute for National Unification said it brings hope of improved inter-Korean relations ahead of the launch of the Park Geun-hye administration. A close aide to Park said it was a "good sign," even though the North is probably just testing the new South Korean administration's appetite for dialogue. Still, the aide added, "I don't see any need to downplay its significance." Kim's call for "reconciliation and unity" with South Korea did not come without strings attached. "All Korean compatriots in the North, South and abroad should launch a dynamic struggle to carry out to the letter the June 5 Joint Declaration and the Oct. 4 Declaration," he said, referring to inter-Korean declarations signed under the two progressive administrations of the South. Five years ago, North Korea went through unofficial channels to check if Seoul was willing to adhere to the Oct. 4 declaration signed by former President Roh Moo-hyun, which included a call to replace the armistice that ended the Korean War with a proper peace treaty. But then president-elect Lee Myung-bak insisted on a fresh set of conditions to resolve the North Korean nuclear standoff and get Pyongyang to embrace reforms, which led to a quick deterioration in relations. Kim stressed that the most important task is to "build an economic giant" and improve the lives of North Koreans. "All economic undertakings for this year should be geared to effecting a radical increase in production, and stabilizing and improving the people's living standards," he said. Here too, he broke with tradition by addressing the economy before political and military issues. He used the word "people" 59 times and "economy" 24 times, way ahead of references to nation founder Kim Il-sung (11 times), Kim Jong-il (14 times), "socialism" (18 times), the "juche" or self-reliance doctrine (13 times) and the "songun" or military-first doctrine (six times). "This reflects the fact that the North's economy fared poorly last year, which was the first year of Kim Jong-un's rule," said Yoo Ho-yeol at Korea University. The relative scarcity of references to the songun doctrine, the brain child of Kim Jong-il, is also interesting. "In Kim Jong-il's day, the songun ideology pervaded all state affairs, but now it seems to be restricted to the field of defense," said Cho Dong-ho at Ewha Womans University. "The ideology is losing its luster." But Kim also said the North must produce more cutting-edge weapons. Nation founder Kim Il-sung used to deliver a New Year's address every year, but Kim Jong-il never spoke in public and instead introduced the annual editorials in the state press. One Unification Ministry official here Kim Jong-un's decision to return to speeches is part of his efforts to model himself on his grandfather, who tried to get closer to the public. Meanwhile, the TV relay of Kim's speech on state TV was full of technical glitches and poorly edited. The broadcast was interrupted several times and other inserts with sound effects thought to be applause at the site were shown instead. Kim Jong-un barely looked up from his manuscript during the speech.